In large bowl, stir together cookie mix and 1 tablespoon flour. Add 1/2 cup softened butter and 1 egg; stir until a soft dough forms. Gently press dough evenly in bottom of baking dish. Bake 10 to 15 minutes or just until dough is set and light golden brown on edges. Set aside to cool. Meanwhile, in 1-quart saucepan, melt 3/4 cup butter over medium heat. Once melted, cook butter about 5 minutes, stirring constantly, until butter turns a deep golden brown. (Be careful because this happens quickly!) Remove saucepan from heat; immediately pour butter into glass measuring cup. Set aside to cool slightly. 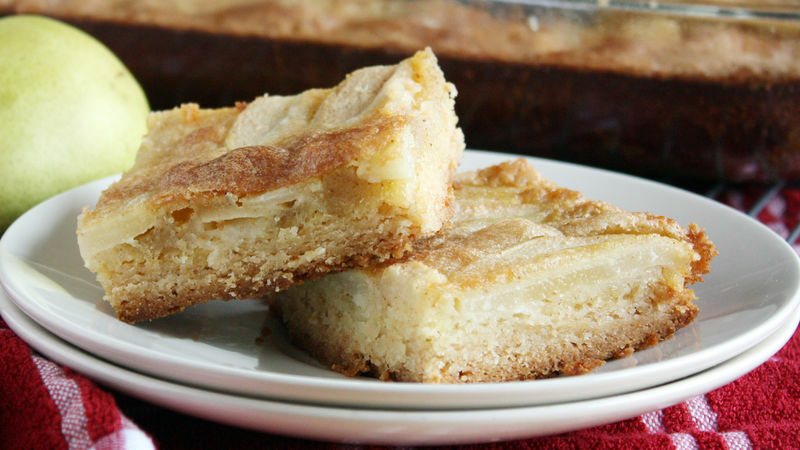 While butter is cooling, place sliced pears in single layer over cooled cookie crust. In large bowl, beat remaining Topping ingredients with whisk until well blended. Gradually add brown butter, beating until smooth. Pour mixture evenly over pears. Bake 40 to 45 minutes or until deep golden brown and toothpick inserted in center comes out clean. Cool completely on cooling rack, about 1 hour. With sharp knife, cut into 4 rows by 3 rows. For even more brown butter flavor, brown the 1/2 cup butter used for the cookie crust. Pour it into a measuring cup and place it in the freezer for about 1 hour or until a “softened butter” consistency. Be sure the pears aren’t too ripe. If they’re really soft, the end result may be mushy. Refrigerate any uneaten bars for up to 3 days. Don’t leave them at room temperature or they’ll get too mushy.